Nikken has been a leader of the Wellness industry since 1975 helping millions of customers around the world to achieve total wellness and a balanced lifestyle through our focus on our Five Pillars of Health – Healthy Mind, Body, Family, Society and Finances. We believe that a balanced life is found through the application of these 5 Pillars of Health. Nikken is built on the philosophy of improving our quality of life and this is reflected in everything we do. Nikken products are inspired by nature and created with the aim of bringing total wellness and balance. Our products benefit from our uniquely developed technologies; Kenko™ Sleep, PiMag®, and Advanced Magnetics. We believe in bringing good health naturally, by using technology that harnesses both the Earth and body’s natural energy. Our products are designed to improve the balance and quality of life through better air, purer water and a good night’s sleep. 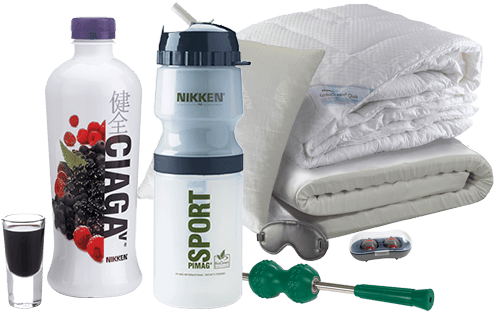 The unique spectrum of Nikken wellness products includes products for you and products for your home, with each offering benefits for a better quality of life. We’re dedicated to making your home a healthier and more relaxing place to be, a place to unwind after the stresses of modern day living. Nikken technologies are based on the application of various forms of natural energy. These diverse products and technologies are integrated to operate with each other and provide an environment that actively promotes good health. To deliver world class products and services that have a positive affect in enhancing our clients quality of life. To inform and educate everyone about the positive effects of living in the environment of a Cosmo Care Wellness home. Nikken Magnetic Technology has been developed in different forms: Field Gradient Technology, EQL (Equilateral) Technology, Magnetic Biaxial Rotation, RAM™ Technology, DynaFlux™ Magnetic Technology, and SpyderRAM™ Technology. Each form offers different characteristics and is adapted to the appropriate products. One feature that all Nikken magnetic technologies and products have in common is that they employ static magnets. A static or permanent magnet is a solid material that has intrinsic magnetism. As such, a static magnet retains its magnetism permanently. Static magnets are available in a variety of strengths. In contrast, an electromagnet relies on an electric current to produce the magnetic field. Because electricity can create a magnetic field, this effect is also found in many objects that use electricity. This alternating (instead of constant) field is responsible for what is called electromagnetic noise. Many scientists and medical authorities consider electromagnetic noise to be potentially harmful to human health. All magnetic Nikken products rely solely on static magnets, including those which employ electricity. The electric current is not used to create the magnetic field. The safety record of static magnets is well established. Magnetic energy is part of the natural environment for all living things. Earth’s magnetic field is also recognised as a protective barrier against dangerous radiation from space. Magnetic Equalising Technology is a principle based on the fact that human contact with Earth’s magnetic field has been disrupted and attenuated by the artefacts of modern civilisation. This technology seeks to counterbalance that effect, and produce an environment that more closely corresponds to the natural magnetic field that has surrounded humans for millennia. 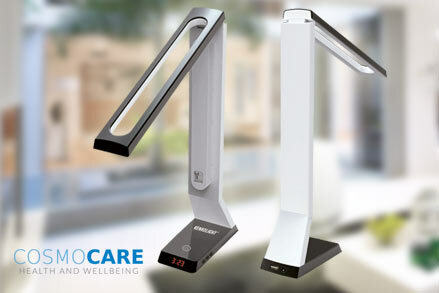 Cosmo Care supply the full range of Nikken products and systems, a major part of the Cosmo Care Wellness Homes programme. Take a look below at some of the major products that can enhance your health & wellbeing. The Naturest® Kenkopad®, Naturest® Pillow, and KenkoDream® Quilt, are designed to work in harmony with one another, providing you with the perfect sleep environment for relaxing, rejuvenating sleep. Tap water can contain traces of many chemicals which include chlorine, sediments, heavy metals, and also pesticides, but we have developed water systems that transform your tap water into clean PiMag® water. 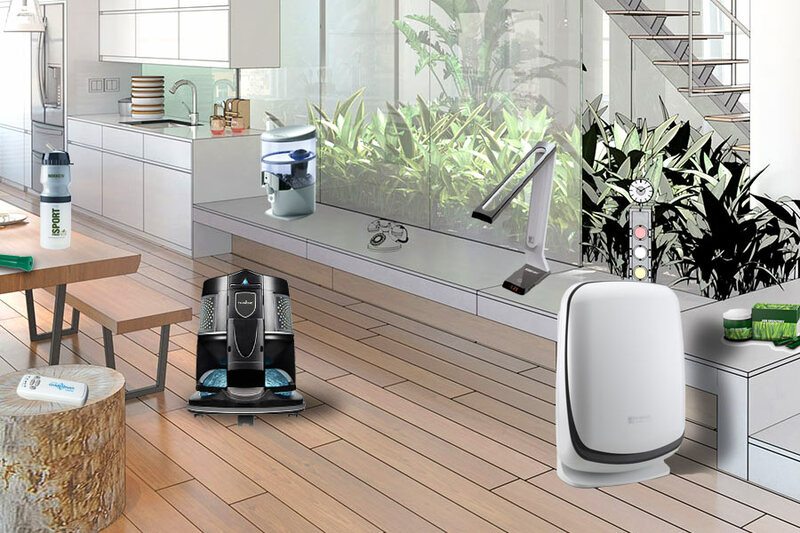 The KenkoAir® Purifier contains a technologically advanced, three-level, filtration system which incorporates: a pre-filter that acts as a physical barrier or trap to remove large particles such as pet hair and dust. The KenkoLight® creates an enriched light spectrum compared to ordinary artificial light, which is a closer simulation of the natural light of the sun. Most organisms thrive under natural sunlight. I wanted to share my happiness with you today. I went to Theo a few days ago for help on weight loss as I a suffer from thyroid for the last 17 years and loosing weight is not easy at all. Theo kindly did an MOT test for my health. He advised me on the best ways of losing weight and believe it I’ve started to lose weight and feel great! Amazing assessment on my general health. Looking forward to my review in 6 weeks and receiving my drops! Other Services and Products from Cosmo Care to enhance your treatment. A short video explaining how we survive with the 3 main elements of air, food and water and how Nikken Technologies provide the solutions and benefits. We are always looking for the things that can make the quality of our life better. Nikken has the technology to provide these solutions. Watch the video! Nikken’s 5 Pillars is to be believed that it gives anyone the opportunity to be a Nikken Representative. It is an amazing business to be involved in. Ask us how you can be part of Nikken! Over 35 years ago Nikken introduced magnetism applied in a completely new way in order to be utilised in an amazing selection of Health & Wellbeing products. The Kenko Sleep System is scientifically designed to increase relaxation and support a variety of physical and mental functions for restful and restorative sleep. The Sleep System combines a Nikken Naturest® Kenkopad with a KenkoDream™ Quilt and Nikken Naturest® Pillow. Each component contains advanced technology designed to improve sleep quality. 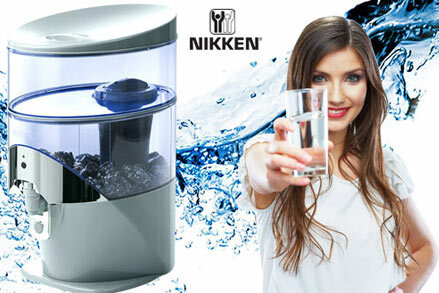 The Nikken Naturest® Kenkopad features a design that has no springs. Its construction shapes itself to body contours. This prevents the formation of pressure points that can interrupt sleep or prevent the sleeper from attaining optimal rest. The latex foundation is firm yet comfortable, and resists sagging. This support system is designed to accommodate all body types. 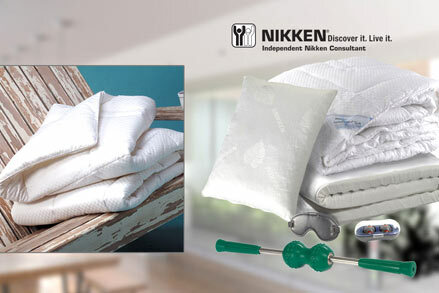 Technology in the Nikken Naturest® Kenkopad and Nikken Naturest® Pillow features spherical neodymium magnets which produce a series of overlapping magnetic fields. This magnetic technology produces a cocoon of magnetism that envelops the sleeper. A massage layer is directly beneath the Kenkopad cover. This layer is a surface of nodules that impart a passive massage effect. It uses the sleeper’s own motion to create a gentle stimulation and help to ease tension. Built-in ventilation – Air-flow ventilation within the various components promotes the free flow of air without creating drafts. Latex foam and fabric breathability insulate but do not trap air in hot spots. Nikken Far-Infrared Technology absorbs energy from a variety of sources — sunlight, body or room temperature — and releases it as energy in the far-infrared part of the spectrum. Energy-reactive fibres constantly receive intake energy and reflect it as gentle warmth. In warmer weather, these fibres reach a limit in the amount of energy absorbed, and the excess heat will pass through the quilt material and escape. Ionic Comfort Technology is the name of a subsystem within Sleep System components that generates negative ions. These odourless, invisible, charged particles, identical to those found in the air in forests and near waterfalls, are emitted by fibres in the quilt and assist in imparting a sense of relaxation. A sleep system that offers improved support for the musculoskeletal system, improved temperature control and additional enhancements in comfort will contribute to quality sleep. This is significant because according to many medical authorities, quality sleep may be the single most important factor in maintaining long-term health. Regular sleep on a Kenko Sleep System can contribute to better mental function such as improved learning ability and decision-making faculty, improved memory, greater alertness and increased mental performance. And discuss how the Nikken products can help you and your wellbeing! The PiMag Waterfall®, a gravity-fed device, features several stages of filtration. 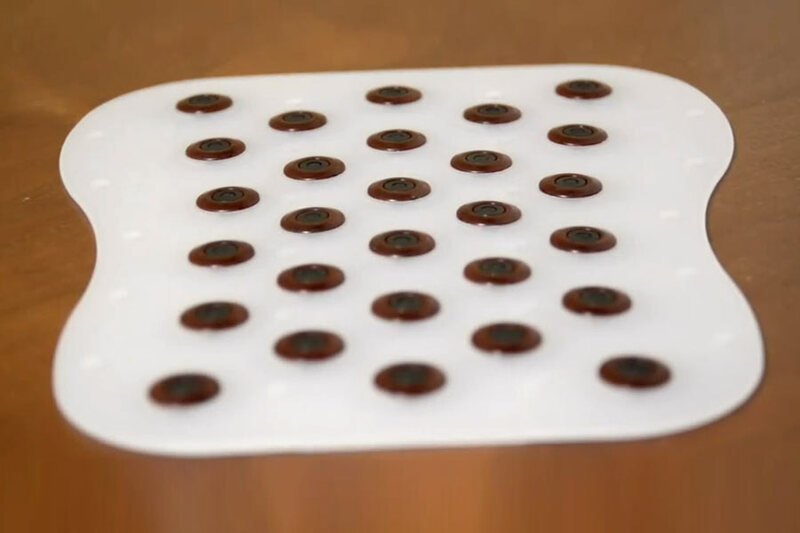 The water flows between spheres of pi ceramic material during this process. The final stage features a bed of mineral stones, based on the agitation/tumble filtration provided in naturally-cleaned streams. The slightly alkaline water produced by the PiMag Waterfall may help offset the acidic nature of a typical modern diet and other environmental conditions. It decreases oxidation reduction potential — a high ORP contributes to oxidative decomposition. An ionising effect further reduces potential oxidation by providing ions to neutralize free radicals. The PiMag® Ultra Shower System uses yet another form of filtration, to reduce the chlorine which is absorbed by the body via the lungs and skin surface when showering. This shower system features technology that neutralizes chlorine through a copper-zinc redox process. In addition, a superfine filter reduces a range of water contaminants such as iron, sulfides and heavy metals. A unique feature of PiMag® Water Technology is the addition of pi minerals to the process. Pi water was originally discovered by Japanese scientists in the 1970s. Observation had suggested that the water from an isolated hillside stream had a remarkable effect on the plant life in the area. The scientists examined the environment and found that it contained an unusual collection of topographical features. The surrounding hills contained magnetite and calcium. The watercourse flowed over silicates, the material that forms natural crystal. The water from it was found to have an atypical combination of minerals, and was naturally alkaline. This alkalinity helps to balance the acidic diet and stress-induced acidity that is commonly experienced in modern life. 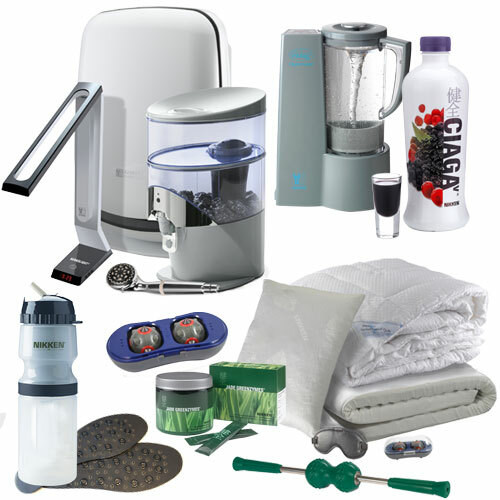 PiMag® Water Technology also possesses advantages over commercially bottled water. An immediately obvious one is cost: the purchase and operation of a PiMag® product, which filters tap water, is an order of magnitude less expensive than the on-going cost of bottled water — which itself is often nothing more than treated tap water. The environmental cost of bottled water is equally formidable. A mountain of discarded, non-biodegradable containers is a potential ecological disaster. These plastics may pose a health risk in more ways than their harm to the environment. Certain chemicals in the plastic containers are known to leach into the water these containers hold, especially if the bottles are stored or on shelves for any appreciable length of time. On consuming this water, these chemicals may be absorbed and retained in body tissue. Owning and using a PiMag® water product avoids the potential for harm inherent in the regular consumption of bottled water. Water is vital to supporting every bodily function: digestion and nutrient absorption, proper circulation, removal of toxins and more. Ensuring an adequate supply of good water is thus essential. 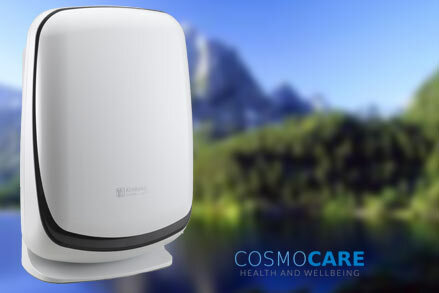 Nikken Air Wellness Technology is a comprehensive system that combines several mechanisms for purifying and treating air. Multiple-stage air filtration, using a number of different approaches in a sequential arrangement. Negative-ion generation, producing an effect considered beneficial to health. A design that avoids the production of ozone, a common by-product of many air-purifying systems. An air quality monitor and automatic operation to maintain a desired level of air quality. The filtration systems in Air Wellness Technology are designed to reduce the contaminants identified as being common irritants in the enclosed spaces created by modern structures and contemporary levels of pollutants. The ultra-low particulate air or ULPA filter in the KenkoAir® Purifier has been thoroughly tested and is certified to reduce these contaminants at performance levels higher than other technologies available in in a home air filtration device. A prefilter and filter combination captures dust, pet hair and similarly-sized particles. The prefilter/filter combination is made of long-lasting, reusable material and has two important functions. In addition to serving as primary filtration, it traps larger particles before they can reach the ultrafine end-stage filters. Carbon adsorption is a highly effective means of reducing contaminants. Adsorption is the capability of a solid substance to attract to its surface molecules of gases or solutions with which it is in contact. It differs from absorption, where the material is drawn below the surface, as with a sponge. Highly efficient adsorption occurs when the adsorbent material is selected for the properties that maximise this effect. Charcoal carbon is ideal for adsorption because its irregular shape offers a large surface area. Activated carbon or charcoal is carboniferous material that has been treated with oxygen to open up millions of tiny pores between the carbon atoms. The use of special manufacturing techniques results in highly porous carbon that has a surface area of up to 2,000 square meters per gram. ULPA technology is a breakthrough in air filtration — significantly more effective than a HEPA filter, the long-time standard for hospital operating rooms, micro assembly clean rooms and nuclear laboratories. HEPA filtration is rated at 99.97% efficiency on particle sizes as small as 0.3 microns. The new ULPA technology in the KenkoAir provides 99.9995% removal of particles as small as 0.12 microns. No other air filtration system matches this level of performance. The filter removes airborne particles from an airflow by one of three mechanisms: interception, where particles following a line of flow in the airstream come within one radius of a fibre and adhere to it; impaction, where larger particles are unable to avoid fibres by following the curving contours of the airstream and are forced to embed in one of them directly; or diffusion, an enhancing mechanism as a result of the collision with gas molecules by the smallest particles, especially those below 0.1 Âµm in diameter, which are thereby impeded and delayed in their path through the filter. Filtration of indoor air has been shown to be effective in relieving or preventing a variety of respiratory discomforts. Daily exposure to indoor pollution may be as much as 100 times as high as that of exposure to pollutants outdoors. This is due in part the increased amount of the day and evening spent inside (up to 90 percent of the total). Reducing indoor contaminants can have a dramatic effect on improving quality of life. Full-Spectrum Light Technology approximates sunlight and is used to supplant conventional artificial lighting, which can provide only a partial and uneven portion of the normal spectrum of light waves. Research suggests that exposure to full-spectrum light may be effective in helping maintain natural circadian rhythms, the cycle of sleeping and waking. Other benefits include a reduction in glare and flicker effect as well as decreased energy requirements.